Cats was revolutionary in its time. Andrew Lloyd Webber’s musical from 1981 is a nearly plotless song-cycle with as much dance as song. It ran for almost five years at Toronto’s Elgin Theatre starting in 1985. Now Nu Musical Theatricals is presenting the first Toronto production since that time at the 700-seat Panasonic Theatre with an all-Canadian cast. I was unable to see the opening night of the new production of Cats, but I was able to attend two weeks later. For a show that has been open only a short time, it already seems tired. The musical is based on T. S. Eliot’s whimsical book of poems, Old Possum's Book of Practical Cats (1939). Since there is not plot, Lloyd Webber and Trevor Nunn, the original director, sorted through Eliot’s unpublished papers. From these came the notion that one tribe of city cats, the Jellicles, gather once a year for the Jellicle Ball when their leader Old Deuteronomy chooses one of their number to be sent to the Heavyside Layer for rebirth into another of a cat’s nine lives. One cat, Munkustrap, serves as our narrator and introduces the famous members of the tribe as they turn up for the gathering. The only way Lloyd Webber and Nunn found to create tension is in setting up expectation for the appearance of various cats. First, we wait for Old Deuteronomy to arrive. Various crashes occur that delay the action are ascribed to Macavity the Mystery Cat, who does not make his appearance until Act 2. Meanwhile, an old cat in sorry condition, Grizabella, once known as the Glamour Cat”, wanders in periodically only to be driven away by the others. We expect we will discover why she arouses so much antipathy, but we never do. It can’t be her age and decrepitude, because the cats are quite friendly to Gus, the aged theatre cat. Act 2 introduces us to more of the famous Jellicles until Macavity appears and for no known purpose kidnaps Old Deuteronomy. These are all delaying tactics whose main excuse is to allow Lloyd Webber to present more of Eliot’s poems. The only question to be resolved involves Grizabella. Instead of revealing why the other cats dislike her so much, Lloyd Webber and Nunn ignore the question to awe us with Old Deuteronomy’s decision to choose her as the cat who will be reborn. Theatrically, this decision seems to based on the fact that Grizabella sings the most memorable song of the show, “Memory”, which, as it happens, is not from Eliot’s book of cats. Nunn, realizing that none of Eliot’s comic feline portraits expressed any emotion, wrote the lyrics himself based on themes he found in Eliot’s “Rhapsody on a Windy Night”. A successful production of the show has to overcome the work’s inherent flaws. Forward momentum has to overcome plotlessness and the creators’ delaying tactics. The actor playing Grizabella must somehow make us care about a someone about whom we know nothing to make her seem the worthiest to be chosen, otherwise the finale comes off as unabashed emotional manipulation. The new production does not succeed on either of these counts. Since the primary action of the piece is dance, we have to get caught up in the show much as we would in a ballet where the choreography and its execution generate the excitement of awaiting each new dance. Choreographer Gino Berti has recreated the original choreography of Gillian Lynne. While it was much acclaimed in its time, Lynne’s choreography now looks repetitive and not eclectic enough to match the varied personalities of the cats portrayed or Lloyd Webber’s music. Lynne has the odd habit of beginning almost every group dance by having everyone take their places in fourth position, arms and feet en avant, as if she can’t think of new ways to start. There’s so much reach-up-high-now-touch-the-ground in her choreography that the dances look more like a Dancercise workout than an expression of mood or feeling. If the point of the show is to distinguish various types of cat from each other, Lynne certainly does not do this except that Mungojerrie and Rumpleteazer have more acrobatics thrown into Lynne’s standard feline dance mix and Mr. Mistoffelees has more ballet. As if not trusting that dance alone could generate enough excitement, director Dave Campbell, following Trevor Nunn, begins dragging out parts of the set in Act 2 as showpieces for the cats. We have a flashback to Gus’s swashbuckling days on the Victorian stage, the assembly of a locomotive for Skimbleshanks, the Railway Cat, and magic tricks for Mr. Mistoffelees. As for the Grizabella problem, we must care about her or what little emotional core the piece has disappears. Ma-Anne Dionisio, who was able to make us care about her as Miss Saigon, here doesn’t seem to know what to do. Her Grizabella’s stumbling about looks more like drunkenness than old age. 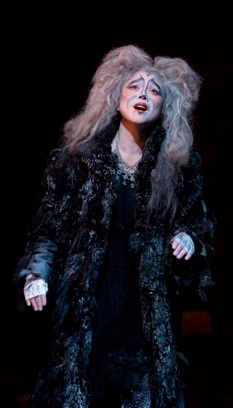 Dionisio’s attempts to show Grizabella’s dignity despite despair comes off as haughtiness. The cats reaction to her Grizabella seems overblown but at the same time Dionisio’s Grizabella never looks like she really wants to join them. All this makes Old Deuteronomy’s decision to choose her not Gus to go to the Heavyside Layer look like dotage rather than wisdom. It doesn’t help that Dionisio sings “Memory” as if she were in a nightclub rather than as a character on stage. The rest of the performances are a mixed bag. On the plus side are Michel LaFleche, whose deep voice and authoritative stage presence make him an excellent Munkustrap. Michael Donald and Neesa Kemeny are a great team as the acrobatic cat burglars Mungojerrie and Rumpleteazer. Their routine had the kind of energy and sense of playfulness sadly lacking in the ensemble as a whole. Jay T. Schramek is an athletic Skimbleshanks and caught the wry notion of a cat who is so serious about his “duties” in running a train. The most moving performance comes from Cory O’Brien as Gus, who speaks rather than sings his song. In the flashback to his youth he is dashing as Growltiger even though the scene is messily staged. As Gus’s companion Jellylorum, Susan Cuthbert is sympathetic and has the clearest diction among the women. She would be very funny in the flashback as Griddlebone, who keeps trying to upstage Growltiger, if the director had thought of something else for her to do besides falling down constantly. On the minus side, Martin Samuel has the right attitude as the Elvis-like Rum Tum Tugger, but he is comfortable singing only in his lower register and has to yelp to hit any of his high notes. Charles Azulay creates the right presence as Old Deuteronomy, but his tenor is surprisingly small for the grand role he is playing. The night I attended swing Austin Di Iulio subbed for Devon Tullock as Mr. Mistoffellees. He did all the required ballet steps including his 24 fouettés en tournant, but, perhaps because he was concentrating so hard, he didn’t generate the outward energy that confidence and effortlessness can create. Lily McEvenue has the important role of Victoria, whose sympathy for Grizabella is meant to turn the tide in the elder cat’s favour. Unfortunately, her tendency to sing sharp makes her reprises of “Memory” less than pleasant. Emblematic of the mixed nature of the show are Ashley St. John as Sillabub and Judy Kovacs as Bombalurina. They take turns singing the jazzy song “Macavity”. Kovacs knows how to put across a full-voiced song like that with a hint of raunch; St. John does not. None of the performers are helped by an unattractive, mysteriously uncredited set that seems to have had use elsewhere. The action does take place in a junkyard, but the designer of this particular junkyard hasn’t decided what scale the objects should be. There is an outsized stove with oven near the centre, but then a carpet-sweeper bottom and the fan of a rake on stage right are the same size as the stove. On stage left there is a backhoe that is too large to be a toy and too small to be the real thing. This set takes up some of the precious space of the already shallow Panasonic stage making it so narrow that only eight dancers shoulder-to-shoulder can fit between the set and the edge of the stage. This gives the entire show a cramped feeling totally counter to the show’s celebration of cats’ freedom and dominion. Lisa Magill’s costumes look like the painted long-sleeved unitards with leg warmers they are rather than suggesting anything catlike. The ratty tails hang from the actors’ belts. Indeed, at some point in the distant future when Cats is out of copyright, someone will be free to present the “cats” simply as dancers caught up in a game and forget the feline fiction. Magill’s costume for the doddery Jennyanydots (Susan Cuthbert) looks like a quilted sleeping bag and her “robe” for Old Deuteronomy looks like a yarn rug that should have been thrown out years ago. Especially disappointing is the concluding special effect when Grizabella is sent to the Heavyside Layer. Four designers for Holographic ParaMotion Design have created a screen that hides Old Deuteronomy and Grizabella where computer-generated images depict what seems to be a waterspout (in a junkyard!) that dips down and carries Grizabella away until we see her renewed like a poor man’s version of Keir Dullea as an infant at the end of Stanley Kubrick’s 2001: A Space Odyssey (1968). Besides its lack of effectiveness, resorting to video as the grand climax of a stage show defeats the point of live theatre. Director Dave Campbell should seek theatrical means to cap a theatrical show. Not to do so shows a lack of imagination. 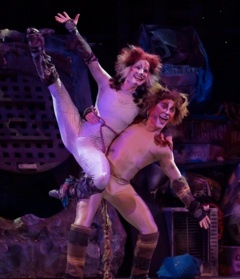 If you have seen Cats before in its original production, seeing this production will not help recapture the magic. In fact, you may very well wonder what made so bizarre a musical so popular in the first place. If you simply want to see Cats because you have never seen it before, this production will let you tick it off your bucket list but may lead you to the same doubts about the work’s potency as those who have seen it before. Only boldness and panache can carry off this strange musical and those are just what this production is lacking. Photo: (top) Cast of Cats; (upper middle) Ma-Anne Dionisio as Grizabella; (lower middle) Neesa Kemeny and Michael Donald as Rumpleteazer and Mungojerrie. ©2013 Rachael McCaig.